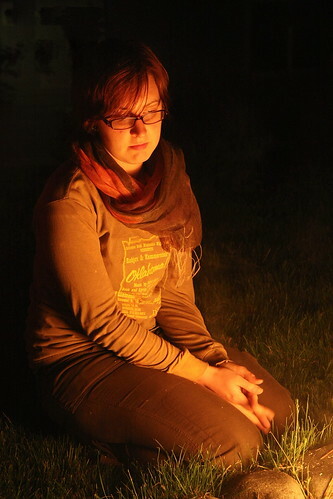 Corinne by Firelight, originally uploaded by The Bacher Family. Corinne is a family friend who visited us in the spring of '09 over Memorial Day weekend. We celebrated the holiday with a cookout in our back yard, roasting hotdogs and marshmallows. Afterward, as it got dark, I spotted Corinne gazing into the firelight, and snapped a picture.